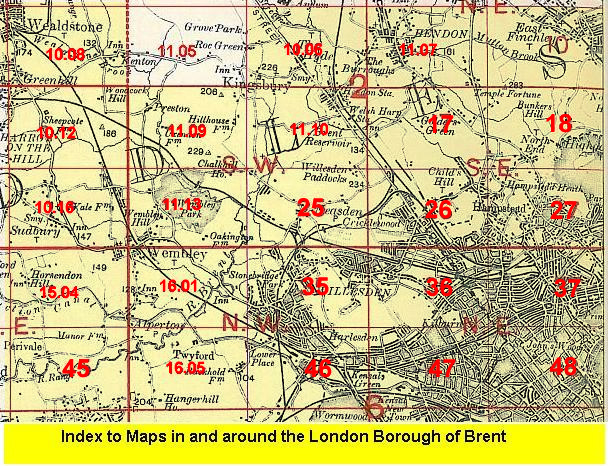 The 1894 map is centred on what was then the rural village of Neasden and covers an area of a mile by a mile and a half, stretching from Kingsbury Bridge to Dudding Hill Junction. Features include the Metropolitan railway works, Neasden station, the MR Midland & South Western Junction line with Dudding Hill station, The Grange, Dollis Hill Lane, Dollis Hill Villa, Neasden Lane, Blackbird Hilll Farm. On the reverse is an extract from the the 1st Edition map showing Neasden village in 1878. The 1936 map shows a much more fully developed area, now busy with railways - the LNER (ie Great Central) lines and a larger Met depot - and with the North Circular Road cutting through Neasden. Another major feature is the Post Office Research Centre at Dollis Hill, where an emergency Cabinet Office was situated during the war. Other features include Gladstone Park, Dollis Hill station, Dollis Hill House, pencil works, etc. We include a selection of street directory entries on the reverse, incl Dollis Hill Lane, Dudden Hill Lane, Neasden Lane, North Circular Road. The map links up with Middlesex Sheets 11.10 Welsh Harp to the north, 11.13 Wembley Park to the west; and with London Sheets 26 Cricklewood to the east and 35 Willesden to the south.